Situated in one of the most animated district of the French capital, the DREAM HOTEL OPERA welcomes you at the heart of Paris business and tourism activities. The hotel features 26 comfortable rooms with WIFI internet. A friendly and dynamic team is at your service to help and advise throughout your stay and 24 hours a day. Information for travel agencies: vouchers are not accepted. 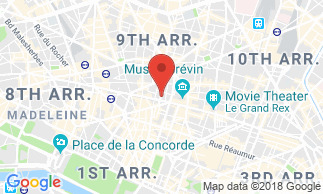 In the very heart of the 9th district of Paris, a few steps from the Garnier Opera House, the hotel is located between the Boulevard Haussmann, the Stock Exchange and Saint-Lazare railway station. Transportation is very convenient and enables you to travel easily in and out of Paris and to reach major business and activity centres (La Defense, Villepinte, Porte de Versailles,...). Hotel Dream Hotel Opera Very good welcome, well located hotel and well-connected to the public transports.